In St. Mark’s Gospel, Chapter 10, a well-dressed man bursts through the crowd and falls to his knees in front of Jesus. He’s like many young people today who enjoy all the comforts of life: a good job, a fine home, plenty of money. He comes to Jesus because his heart aches for something more. He has heard about this wise man: a wonderworker, a prophet. Jesus will have the answer to the emptiness he’s experiencing. 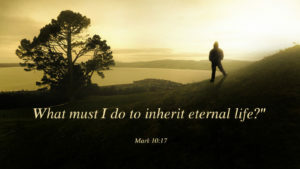 He hears himself saying, “Good Master, what must I do to win eternal life?” To his surprise, Jesus asks him why he calls him good when only God is good. Then Jesus reminds him to keep the commandments. Without hesitation, the young man assures him that he has kept them all since he was a boy. He’s not being completely truthful: “do not commit adultery; do not defraud; do not give false evidence”; are not on a boy’s radar. Moreover, he doesn’t feel the need to ask for God’s mercy: he’s a self- made man; so, what is he asking for? Affirmation that he’s on his way to his eternal reward, perhaps. Jesus looks tenderly at the young man and challenges him: “One thing you lack: go sell everything you have and give to the poor and you will have riches in heaven; and come follow me.” This gets to the heart of the matter. Is he willing to make Jesus Christ the Lord and Saviour of his life? Jesus is offering him the opportunity to turn his life from incompleteness to fulness; from emptiness to joy. The colour drains from the young man’s face. His response is immediate; with a heavy heart, he gets up from his knees, says nothing, and walks away. Peter blurts out that he and the other disciples had left everything to follow him. In response Jesus says that everyone who has done so, will receive a hundredfold in this world; and eternal life. Paul Tillich, a renowned Protestant theologian, said that all you need to know about a person you can learn by asking one question; “What do you worship? What is the ‘one thing’ that is the guiding principle of your whole life?” In the case of the rich young man, Jesus helped him to see that wealth was, in fact, the ‘one thing’ that he worshipped. Maybe the young man should have taken a little longer to discern how Jesus had answered his question; led him deeper within, to imagine a new life devoid of the ‘one thing’ that enslaved him. Perhaps, if he had acted less hastily and taken time for reflection, the outcome might have been different. Are you being asked, today, to surrender the ‘one thing’ that stands between you and complete surrender to Jesus? Are you prepared to spend time, in the depths of your being, to discover what you worship; and once having found it, turn it over to Jesus Christ? If you do, you will receive a hundredfold in this world and eternal life: blessings that the rich, young man could not experience because he walked away.